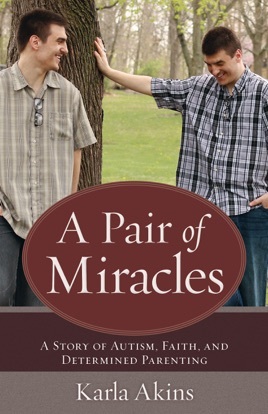 "A parent's gripping journey of awareness, acceptance, and appreciation of her two boys dealing with significant challenges brought on by autism." Thanks to Karla's determination, faith, and unconditional love--and contrary to the doctors' predictions--her adult twins are now able to function independently in many ways. They help their dad install pools, do carpentry work, and serve in the church as ushers, sound engineers, and children's ministry workers.